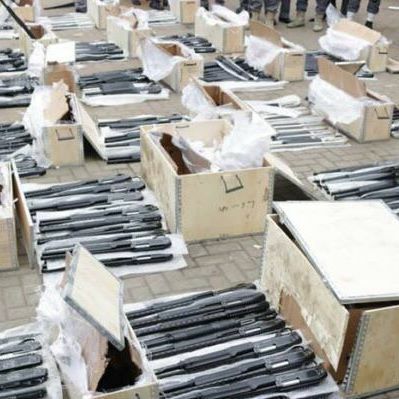 Another container filled with arms has been discovered at the Tin Can Island Port in Lagos, the Nigeria Customs disclosed on Tuesday. A source at the port told PREMIUM TIMES that the container was found at the Ports and Cargo Terminal of the Tin Can Island Ports. “As I speak to you, they’ve ordered everyone to go out of the terminal and they have locked up everywhere,” the source said. The spokesperson of the Nigeria Customs, Tin Can Island Command, Uche Ejesieme, confirmed the incident and said details would be made public later. “We are still counting,” Mr. Ejesieme told PREMIUM TIMES over the phone. The discovery of the arms is coming barely a week after the Chief of Army Staff, Lt. Gen. Tukur Buratai warned soldiers against fraternizing with disgruntled politicians to cause chaos in the country. To forestall any disturbance, the army chief also redeployed some army commanders from their units and created a forward base army unit in Katsina, the president’s state. There have been rumours of some soldiers plotting with some politicians to violently overthrow the government of President Muhammadu Buhari who is currently in London receiving treatment for an unknown ailment.